This post would not be useful in spoonfeeding you the information about UK history, but may be usefully serve as a guide or a framework to locate Uttarakhand History in general history of India. Proto and pre history:- Cave paintings at Lakhu Udyar and Gorkhyali Udyar; also some stone age tools; megaliths also found. Same as in other parts of country. Epic era:- Mahabharat mentions Subahu, King of Kunindas from this area. Pandavas passed from here while going to Himalayas. Earliest inscription:- At Kalsi(Dehradun) by King Ashoka. Shows it was an important area. Sources of history:- Puranas give lists f Kings of various dynasties. Also coins provide names of Kings. Kumoan called Manas Khand and Garhwal as Kedar Khand. Both called Brahmpur together. Post Kunindas:- Shakas etc. ruled in plains but Kunindas persisted in hills. Later Katyuri Kings ruled for significant time and built most of temples. Katyuris:- Starting with Basantandeva, 3 dynasties. Ruled till 11th century. After them Panwars in Garhwal and Chandas in Kumoan. Katyuris later split into many branches and ruled under Chandas. Their capital was at Kartikeyapur and later at Baijnath. Chandas:- Followed Katyuris in Kumaon. Originally came from Allahabad. Initially ruled in Champawat area but later shifted capital to Almora. Major Kings:- Gyan Chand, baj Bahadur Chand, Udyot Chand, Lakshmi Chand etc. Supplanted by Shah Kings of Garhwal during 18th century and later by Gorkhas in 1790. Panwar Dynasty:- Ruled Garhwal starting with Kanakpal. Took title of Shah. Defeated Qarachil expedition of Tughlaq. Rani Karnawati. Supplanted by Gorkhas in 1805. Got back a shrunken kingdom from British and since then called Kings of Tehri. Gorkhas- Ruled Kumaon for 25 years and Garhwal for 10 years. Defeated by British and by treaty of Sugauli gave the area of Uttarakhand to British. British:-Since 1815, ruled by Commissioners such as Trail, Ramsey etc. 1857 revolt:-Kalu Mahra only revolutionary; Kumoan Parishad, Kuli Begar(Non Cooperation Movement), Chandra Singh Garhwali, Sridev Suman. Contribution of Uk in National Movement, INA etc. The option for filling main centre is live on ukpsc website. You can visit this link and fill your Exam Centre. There are two exam centres namely Haldwani in Kumaon and Haridwar in Garhwal. You have to enter your roll number and date of birth to select the choice. The fee payable for general candidate is Rs. 250 and can be filled by either Challan, Card payment or net banking. The facility for submitting choice is open till 23.05.2017 and of submitting fee till 25.05.2017. For a period of ten years from 2004-05 to 2014-15 said Uttarakhand has emerged at the top by clocking the highest compounded annual growth rate (CAGR) of 16.5 per cent and 12.3 per cent in industry and services sectors during the period among states across India. Services sector which includes hospitality and tourism, hotels and restaurants, transport, storage, communication, banking and finance and other such activities accounted for 51 per cent share in gross state domestic product (GSDP) in 2014-15 thereby increasing from 49.5 per cent in 2004-05. However, Uttarakhand’s performance in the agriculture sector and allied activities paints a grim picture as its share in the GSDP has declined sharply from over 22 per cent in 2004-2005 to just over 9 per cent in 2014-15. Considering that over 51 per cent of the state’s total workforce and about 67 per cent of total rural workers depend directly or indirectly on agriculture for their livelihood, Uttarakhand government should promote a separate policy for hill farming specially for horticulture, herbal farming, bee farming, mushroom farming etc. Despite a facade of development, it should be remembered that Industries are in Uttarakhand only for tax reasons and profit is shifted elsewhere. Also many intermediate goods are manufactured here rather than finished goods. The jobs created by industry for Uttarakhand people are of low skill and mostly highly skilled jobs are taken by people from other stated. What we need is low skilled, non polluting and labour intensive sectors to be promoted in Uttarakhand. We should also think in terms of forward linkages and backward linkages which may establish Uttarakhand as a dominant state in certain products due to efficient supply chain management. In services sector the story is similar. Its mainstay is tourism and hospitality along with hotels and restaurants. Not being a labour intensive sector, it has not produced enough jobs. However many unexplored and pristine locations present opportunity for high end high value tourism. We also have opportunities for paying guest model of airbnb. All of this ould also need better connectivity through roads and rail, storage and packaging facilities, educated and skilled human resource, energy and enabling environment including favourable tax policy, less bureaucratic hurdles etc. I would attempt to write some articles about certain topics related to Uttarakhand, which may be important from the point of view of exams. Today we talk about 1857 revolt in Uttarakhand. 1857 was a seminal event in the History of India. It changed the British attitudes towards different parts of India and indeed changed the way in which India was governed. Its causes included the disenchantment of peasants, de-industrialisation and its effect on artisans, the loss of prestige and power of landed gentry, the anger of traditional religious leaders and other sundry effects of colonialisation. In Kumaon and Garhwal, the situation in 1857 remained peaceful except a few skirmishes with men under leadership of Kalu Mahra, Anand Fartyal and Bishen Kharayat in Champawat and Kali Kumaon region. Mostly the common people remained aloof from the revolt. The British administration not only stood tall but also defeated the rebels and stopped them from entering the hills. The administration even granted shelter to officers who had ran away from other nearby areas and provided for their salaries, upkeep etc. It also provided a route for accessing Nepal and got the Nepali Army to help the British in crushing the revolt. 1. The British had replaced the cruel and unjust Gorkha rule in 1815. Compared to Gorkha rule, British rule was found amiable by people of Uttarakhand. They did not want return of old Gorkha or Chand rule. 2. The Commissioner of Kumaon, Henry Ramsey was well respected due to his genial and down to earth nature as well as his tendency to listen to people’s grievances. His stature also helped in keeping Uttarakhand in favour of British. 3. The exploitative nature of colonialism was not obvious to the people of Uttarakhand. 4. The inaccessible and difficult terrain made it hard to coordinate any rebellion or even let the news of rebellion reach in the interior areas. 5. King of Tihri actually helped the British during the revolt as he had been given his throne by British after 1815. 1. The Garhwali and Kumaoni people were included in martial tribes and recruited in large numbers in Indian army, where they still serve in large numbers. 2. Indirectly economy of Uttarakhand grew due to money orders received from armymen. 3. The position of King of Tehri was strengthened after 1857 due to his loyalty. Discipline is important in achieving anything that requires a high level of skill, be it in any area of life like music, craft, art, science etc. 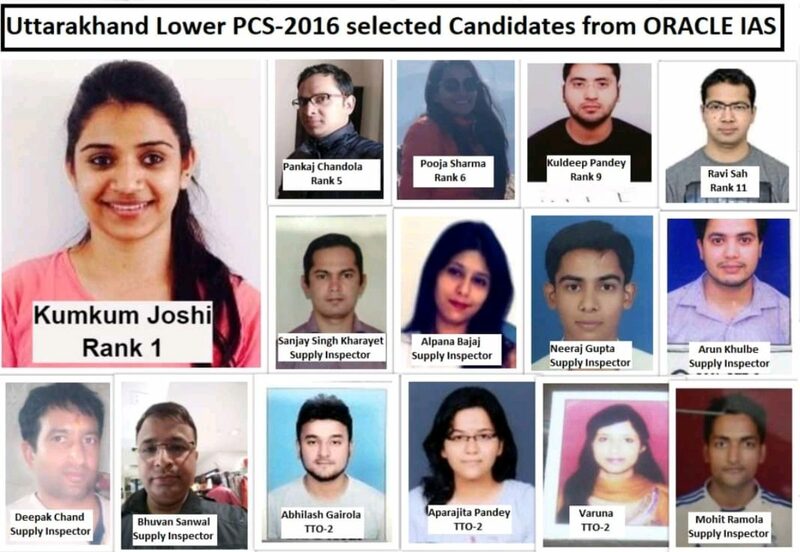 During my observation of Civil Service toppers both in UPSC and PCS, i have always found one thing in common: They were very disciplined. They had a set routine, which they followed religiously. What actually sets an average aspirant apart from the toppers is their willingness to follow the same routine day after day for months on end. It is reflective of the aspirants’ commitment towards his/her goal. It looks easy, but is actually a tremendous drain on your mental strength and will power. To work with such a routine an aspirant has to be cut off from distracting things. Avoid family functions, avoid wasting time, but do regular exercise. He has to make a long term plan and break it into short term goals that are achievable. Success does not come easy. Please start preparation of Civil services if you are willing and capable to pay such a price. A unit is an established standard for a physical quantity against which particular examples of that physical quantity can be compared. The act of comparing a physical quantity to a unit is called MEASUREMENT and the MEASURE of a particular physical quantity is the ratio of that physical quantity to the unit. For example, let us take the physical quantity, distance, with a value of 25 metres. The units are metres, and if we divide 25 metres by metres, we get the measure which is 25. The measure is a numerical value. When we perform calculations, we manipulate the measure, not the physical quantity. Some physical quantities are chosen as base quantities. Other physical quantities are obtained from the base quantities using the appropriate algebraic relationships and these are called derived quantities .Base quantities are said to have base units and derived quantities have derived units. For example, if displacement and time are chosen to be base quantities, then velocity is a derived quantity. Note that metres/second is pronounced “metres per second”. By international convention seven physical quantities are chosen for use as dimensionally independent base quantities. Mostly the INTERNATIONAL SYSTEM OF UNITS (which is abbreviated “SI”, from the French “le Système International d’ Unités”) as defined by the International Standards Organization is used. SI units are widely accepted and are established by law in most countries (the United States being a notable exception). The SI base units are shown in the table below. All SI units that are not base units are expressed as combinations of the base units. A SI prefix is a name that is added to the name of a basic unit and which indicates whether that unit is a multiple (or a fraction) of that unit. For example, the prefix “kilo” added to “meter” gives “kilometer”, which is a unit 1 000 times LARGER than the base unit “meter”. Similarly, the prefix “milli” added to “gram” gives “milligram”, which is a unit 1 000 times SMALLER than the base unit “gram”. The table shown below lists the names of approved SI prefixes. Decimal multiples are formed by adding prefixes to the name of the SI unit. This avoids having to use cumbersome numbers of digits. It is considered good practice to use prefixes representing 10 raised to a power which is a multiple of 3. For example, 100 ms is preferable to 10 cs or 1 ds. For historical reasons, some multiples of SI units are given special names. While these units are not part of the SI, they are precisely defined in terms of SI units, as shown in the table below. Prefixes are added to the unit name, and written as one word, e.g. megawatt. Compound prefixes such as millimicrometres are not used. In the case of derived units, only one unit takes a prefix. We write km·s-1 and not mm·µs-1. #UKPSC #UKPCS 2016 Main Exam Notification is out!! 7. Fees:- Gen: 250; OBC/Independence Activist dependent/ex-servicemen: 150; SC/ST/PH:-100. Please check the notification here. Also available on Old Documents page. Author wamsucrrPosted on May 5, 2017 Categories UncategorizedLeave a comment on #UKPSC #UKPCS 2016 Main Exam Notification is out!! 1. Paper came from all three branches of Physics, chemistry and Biology as well as from Computer Science. 2. Almost all questions could be found in NCERT books. 3. Some conceptual questions were there but mostly factual and numerical were also there. 4. It is possible to score good in this paper. Infact this paper can differentiate serious aspirant from non serious aspirant. 1. For science students, read all the NCERT books and for Computer Science too. 2. For students of other stream, this could be a very tough paper. You should at least read some masala book like Science from Arihant or Lucent. Please focus on factual if you are unable to tackle numerical questions. 1. World geography follows predictable path and can be easily covered from standard books. 2. Indian geography also is not very difficult to tackle. Most of the questions are those already asked in UPSC exams and not very analytical. study. These are usually for 2 or 5 markers. 2. For long answers study problems of Uttarakhand and think about these. Specially focus on current and peristent issues. Time management for studies: the key to success. 1. Creating a conducive environment, which includes among other things cutting yourself off from distractions. 3. Division of syllabus into smaller parts which can be doable in smaller time units like 1 day, 1 week, 1 month etc. 4. Sticking to your goals as per the divided syllabus. One can use different techniques like Yoga, Pomodoro etc. for achieving concentration. Author wamsucrrPosted on May 3, 2017 Categories UncategorizedLeave a comment on Time management for studies: the key to success.